Six of the best junior school choirs perform a hymn of their choice to impress judges Russell Watson, Suzi Digby and David Grant. Browse content similar to School Choirs 2012 Junior Semi Final. Check below for episodes and series from the same categories and more! the School Choir of the Year competition. The tenth! to sing to win a place in the final. for this first semi-final of the 2012 competition. because only three of them can go through to the final in two weeks. Which choirs will it be? We have, from Yorkshire, St Martin's Ampleforth! From Hertfordshire, Heath Mount School! From Derry in Northern Ireland, it's St Patrick's Primary School! From Cambridgeshire, Gamlingay Village College! From Croydon, Coloma Convent Girls' School! And from Huddersfield, Lindley Junior School! I think they've brought along a few supporters! here's your chance to sing along with our audience in the theatre. You'll know this hymn, I'm sure, and it should get things going. It's Give Me Joy In My Heart. You're all in very, very fine voice. if they're going to progress beyond the semifinal. It's our judges. in the music industry - Will Young and Take That, to name just two. It is, of course, David Grant. as a conductor and choral director. It is Suzi Digby. it's a local boy who knows a thing or two about singing. He's performed to royalty, presidents and even the Pope. Please welcome the people's tenor, Russell Watson. David, what are you looking for? really accurate and that make us feel tingles. of the interpretation of the text. -I want those lovely little faces to make me smile. I'll try my hardest, Russell! OK, choirs, now you know. Thank you, judges. Here's where the competition truly starts. Each of our six choirs will sing their choice of hymn. the judges will select three choirs to go into the final. Going first, a choir who made the final three last year. Will they go one better? It's Heath Mount School from Hertfordshire. The whole competition is something they've really looked forward to. "Are we going to be doing the BBC again?" I never tell them. I secretly recorded them and then sent it off. Very pleased that we've got through once again. That has to happen every time. because we've been in it before. and hopefully, that will really make Mr O'Brien really happy. We're really glad to be here. All very excited, although we're nervous at the same time. because they're really good singers. David, never easy opening a competition like this. They did rather well, didn't they? I think she worked through them really well. if you're not doing harmonies, it makes it easy, it's simple. But actually, if you're getting it wrong, it will be exposed. is whether the others that come on can match that. Susie, what are your first impressions? A couple of tiny technical things. you just need to work on that. -They're an experienced choir, did that come across? I've got to say, this year, I can see a vast improvement. I think your performance, as we say in Salford, was absolutely smashing. Thank you, Heath Mount School! and you have to get it right, otherwise you won't get through. Looking at the judges' comments, I really think we have done enough. I was worried they were going to say we were really bad! I think I was more nervous than the children. I was desperate not to show it, but I think they've worked it out. Four years ago, our next school won this competition. they're back for more. It's Lindley Junior School from Huddersfield. of All Things Bright And Beautiful. as well as being the most beautiful piece. then it sounds really good. And she's also a really lovely person. I'm still not hit in the face by this wall of beautiful sound. to get ready for the competition at the Lowry, and we'll be ready. We're all really excited to be on TV. I'm a little bit nervous, but once I get on stage, I'll be fine. where we can be on a national stage. Terrific. Suzi, the choir already has a trophy back in the cabinet in Huddersfield. Are they in line for another one? I'm not surprised. What fantastic commitment. Physically, as well as aurally. It was really wonderful. so that you can actually hear a whole line of text. But it was marvellous. Thank you. Nothing worse than leaky phrasing, ladies and gentlemen. -Russell, was it bright and beautiful for you? and it made me feel good. It made me feel happy. I liked your smiling faces. Yeah, I thought it was excellent. the harmony finished before the melody had finished. It was almost like, some singers were, "Ah! We've got to the end now!" to the very end of the last note. Thank you very much, judges, and thank you, Lindley Junior School. and I could hear it loud and clear. Thanks to all our supporters. at the School Choir Of The Year competition. It's St Martin's Ampleforth in Yorkshire. and to hear such beautiful voices. They are really joyous words, they're praising the Lord, so we should be happy too. because it's very much a part of what we believe. St Augustine said whoever sings well prays twice. and we're really pleased to be here as well. To be honest with you, I'd be very happy to get through to the final. Very happy. But more than that, I'm not prepared to say! Thank you to St Martin's Ampleforth! Russell, you're used to singing out front. Didn't he do well? -That was absolutely fantastic, Rupert. You're out there on your own as well and all your friends are behind you, which is even more daunting. -The perfect choice of song. The arrangement was subtle, the build was subtle. the languid, long phrases were very, very daring. Their breath control was immense. I thought they were magnificent. Suzi, it's a really, really well-known piece. Good choice, or not? just for the reasons David just said. and you've to sustain the breathing with young singers like that. I thought the quality of singing was just right for the song. Excellent. Thank you, judges, and thank you, St Martin's. You come off and you can't believe you've just done that. I'm glad it's over and done with. I'm still shaking with nerves. If we don't win, we don't win, but everybody's done their best. I wonder if you've already got a favourite? Hang on, we're only halfway through. Our next choir are waiting patiently for their moment in the spotlight. They are Coloma Convent Girls' School from Croydon. that's based in a culture that isn't necessarily particularly English. Who are you going to be watching when we sing? Who's it going to be? Look at me. Thank you. We're hoping we can do our best and show the world what we can do. The mood before they arrived was brilliant. Our school is all about faith. so the ethos of our school is very much embedded in your programme. So it means an awful lot in so many different ways. But they're very upbeat and very excited. The Coloma Convent Girls' School! David, a different performance. It was great though, wasn't it? The standard this year is really high and that was another high standard performance. but I understood the joy, I understood the uplift. I loved the use of harmony, loved the use of counter melody. let the euphoria with which you are singing be reflected in your faces. -What was really incredible about this choir was the consistency of tone they get. Not just when they're singing in unison, but when they're singing in three parts. and get their bodies relaxed and be really into those movements. Then you could match the quality of movement with the singing. Russell, it's quite difficult, moving and singing, though? -Yeah, I don't do that! I don't think I could, but there we go. "I actually don't know what you were singing about, but it sounded good." And it's the same sentiment from me to you. Thank you, judges, and thank you to Coloma Convent Girls' School! so I think it was good. We could feel the support of the school there as we went on. You just felt very loved. It was nice. Tension is mounting. There are just two choirs still to sing. but didn't quite make the final. Will they get there this time around? It's Gamlingay Village College from Cambridgeshire. all the problems that we have in the world. This is a song that really can touch everyone. Last year, we got to the same stage of the competition, but didn't get through to the finals. But this year, I think we've got a really good chance and we're going to give it our all. so you've to try and put the voices together to make a choir. because we know what's coming. that everyone's got the tissues ready before we go on. but I hope they're going to give us a chance. Gamlingay Village College Choir, ladies and gentlemen! So, Suzi, what did you think? What I love about this choir is that it's got this lovely, fresh, natural sound. It's so important for children to sound like children. Words like "Galilee" and "paradise", you'd say "Galilee" and "paradise". When you sang it, you went, "Gali-LEE" and "para-DISE". and perhaps lighten some of the syllables as you'd speak it. Then, I think you'd transform the performance. But overall, it was really lovely. I enjoyed it very much. Russell, they were in the competition last year. -Has that experience paid off? What I like about this choir is the innocence and the purity. but it's the purity that I find so attractive. You looked like you were enjoying it. I enjoyed it too. Well done. David, that's a little-known hymn, I would say. Is that a good choice? an opportunity to show a bit of heart, soul and passion. are going to be equalled by the heart and the soul of this choir. So they've made our jobs very hard. if we were to make it through, we'd all be cheering in our head! and sounded like children, which is rather lovely. Our final choir are from the second biggest city in Northern Ireland. It's St Patrick's Primary School from Derry. The reason that I selected "The Lord of the Dance"
and that they would relate to. Life at St Patrick's Primary School, it's a great place to be. It's a very fun place. and there's an awful lot going on all the time. Going over to Manchester to be in the semi finals is exciting. if our choir's good enough to get through or not. and that we're representing our country as well, so we're very proud about that. Hopefully, we've brought the luck of the Irish with us! Lots of the children are wearing their little guardian angels for extra luck today. St Patrick will be on our side, and hopefully, he's praying for us. Russell, tell me, did the cute factor get to you? They are so cute, it's unbelievable! When you started, the three of us were laughing. We felt joyous. and it made you feel sad. You got so much light and shade into the performance. It was just stunning. Well done. Suzi, we've heard that hymn before somewhere, haven't we? -Heath Mount sang it as well. Does that matter? Not in the least. It was like a completely different animal. but I've never heard a children's choir with such character. in the right way, obviously. I enjoyed it enormously, and technically, it was very good. David, last word to you. Each choir different and bringing its own thing. to run a million kilowatt power station! A dynamic performance. A great way to end. Thank you to the dynamic St Patrick's Primary School! I don't think anyone was nervous when we got up. -I think that we did our best. -We couldn't have done it any better. and our choirs are chewing their nails backstage, awaiting their decisions. here's a reminder of why the judges have such a tough job ahead of them. I thought it was confident, it was comfortable. It felt a little safe to me. There was a lot of merit in the performance. It was very polished. They've definitely been well coached. You could see that. A touch too much. I think they're a contender. They're a possible. They lacked variety in tone. there's not a great deal you can do. It's not like 'Lord of the Dance'. -That doesn't help at all. Can they bring their whole level of performance up to their singing? That's the question. -These were the really sweet, innocent, cute kids. Natural, fresh. They made me smile. It was more, "Aw" than "Wow". at times, it veered towards the funny inappropriately. This story, when THEY sang it, had a beginning, a middle and an end. Our judges are back in their seats and our choirs are back on stage. The atmosphere, I have to tell you, is very tense. from these young, wonderful choirs. perhaps just a brief word from each of you on the performances today. of school singing and young children singing together at its very best. Russell, how difficult was it reaching that decision? had their own special attributes that we were all drawn to. Suzi, what do you say to the three that don't quite make it this time round? I hate to think of you all not going through. You've all been fantastic. You've certainly brought us a great gift today of your performance. who has made it through to that final. David, please can you reveal the first choir going through to the final? the second choir going through to the final? going through to the final? 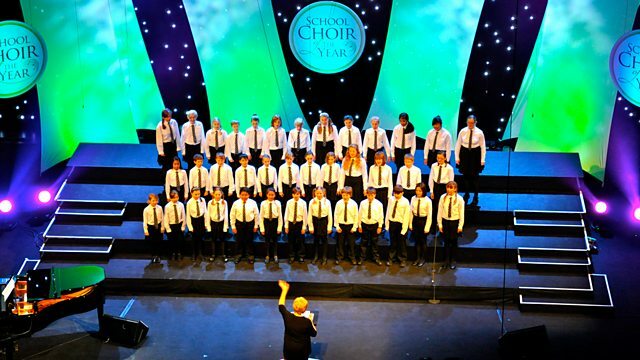 the 2012 Songs of Praise Junior School Choir of the Year. for all our valiant other semi finalists. Next Sunday, the spotlight turns on the senior school choir semi finalists. before three of them are chosen for the final. Six of the best junior school choirs perform a hymn of their choice to impress judges Russell Watson, Suzi Digby and David Grant, who have to decide which three make it to the final, as Aled Jones introduces the first of three special programmes from The Lowry Theatre in Salford.